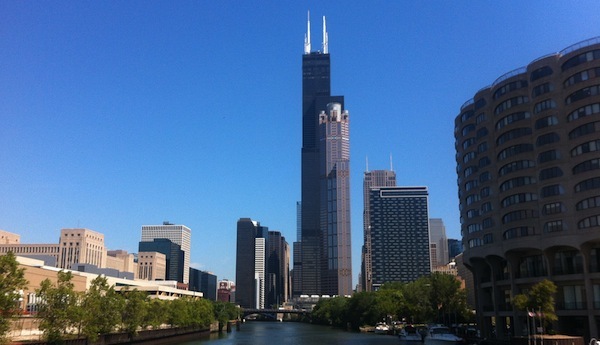 Sept. 26, 2012, 12:10 p.m. Fewer than half of those surveyed in any size of community said they rely on a print newspaper. By Adrienne LaFrance @adriennelaf Sept. 26, 2012, 12:10 p.m. Residents of cities, suburbs, small towns, and rural areas have distinctly different news consumption habits, according to a study out today from the Pew Research Center’s Project for Excellence in Journalism and Internet & American Life Project. Pew found that while those surveyed in different communities reported similarly high levels of interest about most of the same topics, their habits differ based on where they live. Some of the findings are intuitive — like how suburban residents, many of whom commute to work, are more likely than their urban counterparts to listen to the radio. Another example: Residents of large cities tend to be less interested in issues related to taxes, which could be because city-dwellers are likely to be younger and renters. Urban residents were also least likely to pay for a subscription to a local newspaper. Fewer than half of those surveyed in any type of community said they rely on a print newspaper. Across the board, residents track local news more than other kinds of news. 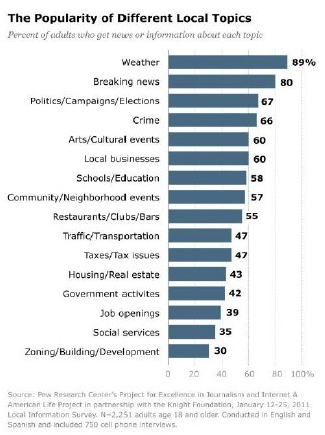 Weather is the most popular kind of news, followed by breaking news and politics. Most residents in large cities, small cities, and rural areas reported relying on word-of-mouth for news. Suburban residents are more interested in national news than are residents of cities, small towns, and rural areas. Other distinguishing factors come down to choice: People generally want similar kinds of news and information, but they don’t always have access to the same news resources. Large-city dwellers and suburban residents, for example, are more likely to have multiple devices like tablets and smartphones. Likely to engage with news content by sharing it, commenting on it, etc. Photo by Dennis Yang used under a Creative Commons license. POSTED Sept. 26, 2012, 12:10 p.m.
LaFrance, Adrienne. "New Pew study: Where you live helps shape your news diet." Nieman Journalism Lab. Nieman Foundation for Journalism at Harvard, 26 Sep. 2012. Web. 20 Apr. 2019. LaFrance, Adrienne. "New Pew study: Where you live helps shape your news diet." Nieman Journalism Lab. Last modified September 26, 2012. Accessed April 20, 2019. https://www.niemanlab.org/2012/09/new-pew-study-where-you-live-helps-shape-your-news-diet/.